Earlier this week I heard from Catherine McBride, of Investment Centers of America, that Malt-O-Meal had pledged, let’s say a substantial sum, to underwrite the cost of casting Ray “Jake” Jacobson’s sculpture “Harvest”. This is a huge boost to Ray’s efforts to get this sculpture erected in downtown, the historic heart of Northfield. As reported earlier this year, Ray was working to get this piece, celebrating Northfield’s milling history, placed near Ames Mill. 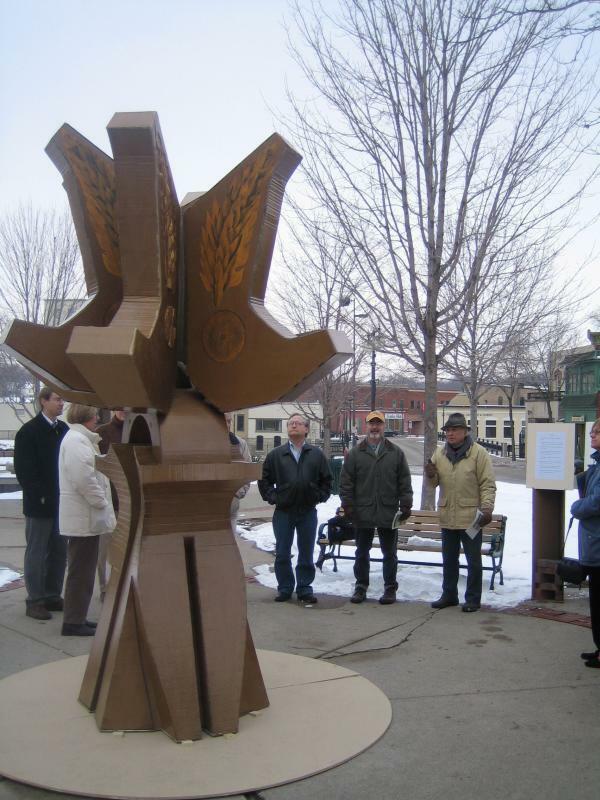 With a little help from the NDDC, Mendota Homes and Community National Bank, Ray got the sculpture mock-up displayed downtown and then got a few local “dignitaries” to view it and, more importantly, discuss making it happen. At the urging of NDDC Board Members Brett Reese and Dan Bergeson, Ray got in contact with Rob Shanilac of the Sesquicentennial Committee. That group granted Ray some seed money for his effort, Council Member Dixon Bond worked with City Staff Member Howard Merriam to get the base of the sculpture included in the proposed Water Street Park renovation, and Ray was steadily moving forward. This will be a wonderful addition to our authentic downtown, our historic milling district and our emerging art town. It is certainly satisfying to see so many individuals and groups working together on this exciting effort. There is still a need for additional donations. The generosity of Malt-O-Meal, although significant, will not cover the entire cost of the project. Interested community members can donate to the Historical Society for the benefit of the Sesquicentennial Legacy Plaza Project. A bank account has been established at the First National Bank of Northfield to accept cash gifts. For more information on other gifting options, please contact Mark Fagerwick at the Historical Society.